Alec will start nursery school in the fall and although it won’t be more than a few blocks away, there will be the logistics of dropping off and picking up to contend with. Probably my husband will drop Alec off before heading to work most days, and then I (with Baby #2) will pick him up in the afternoons. We might go straight home, but we might also head to the park, have a snack and play for a bit. There will also be those weeks when my husband is away or has meetings and I do drop-offs and pick-ups. While Alec is at “school”, Baby #2 and I will be out an about in the city. Maybe not every single day, but most days. This will involve errands, shopping, baby check-ups, walks etc. We live right in the middle of Stockholm and don’t use our car much on a daily basis (more on the weekends and holidays when we are out as a family). But we walk a lot, and sometimes we take the bus or the subway, although I am not sure how often I will do that on my own with both children. We live in a building with the smallest elevator known to man (as in, you could fit two adults in there, but you would want to know each other REALLY well), so we leave our stroller in the very cramped stroller room in the foyer and then take everything else up in the elevator (so if Alec falls asleep when I am out walking, I keep walking). On the weekends we often buy lunch and bring it with us to the park for a nice long play. We run a couple of errands, we visit with friends (by car, bus, subway or walk). But on the weekends we are usually out as a family. BABY JOGGER CITY SELECT. In the US, ca USD 785 for stroller, second seat kit, bassinet kit, belly bar. In Sweden ca SEK 10 300. BUGABOO DONKEY. In the US, ca USD 1499 for Duo configuration. In Sweden ca SEK 14 800. TEUTONIA TEAM COSMO. Ca SEK 7800 in Sweden. BABY JOGGER CITY MINI. In the US, ca USD 400. In Sweden ca SEK 5800. The Teutonia Team Cosmo was a given on our list since we are so happy with the Teutonia single stroller that we have now. I love the level of comfort that their double stroller offers the children, and I have a lot of confidence in Teutonia’s high quality and robustness. I also liked that it is possible to have the children rear-facing. The price is also very good. But a number of considerations have led to us removing the Teutonia double stroller from our short list. It is very wide, and there is nothing you can do to adjust it into a single stroller. We would need to keep our old single stroller for walks with just one child (which would be an easy transfer since we could just lift over the entire bassinet insert from the double to the single), which would mean always having to head home in between to switch strollers, and which would not be really feasible in our already over-crowded stroller room. Also, you can’t have one child rear-facing and one child front-facing. So Alec would end up having to sit rear-facing for much longer than he will probably want to, and then Baby #2 will have to be front-facing much earlier than I would like (and than is recommended here). So the Teutonia is off the list. 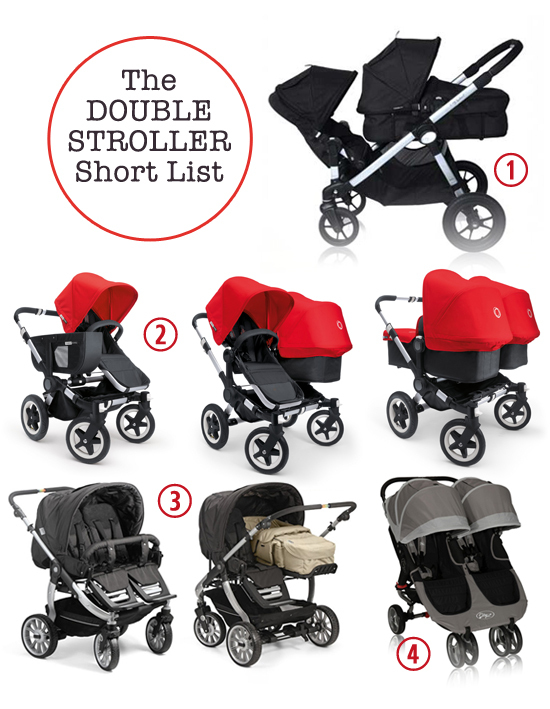 For more on the strollers that are still on our short list – check in tomorrow! We have your option number 1. I like that it can be used as a single stroller but it is very heavy to put in the trunk and hard to maneuver as a double. I also wish it had a “ståbräda” option as I’m not sure how long big sister will be interested in sitting in a stroller . We tried no other strollers and bought this one because a friend of mine got it and I figured she had researched it and I knew I did not want to dude by side stroller . The most common stroller here among the “cool moms” is the BOB stroller but I don’t think you have it in Sweden. I also have the City Select and agree that it’s reallllly heavy and long front to back, and doesn’t sound like it would be a good option at all for you. I too like all the positives it has (convertible to single, lots of positions and forward/rear facing) but it’s super long — I’ve more than once nipped someone’s heels who was walking in front of me because I can’t see how far forward the stroller goes — and very heavy with my 1.5 year old and car seat with 2 month old in it. We plan on getting the city mini double stroller in addition. We also have the uppbaby single stroller and rejected converting it to a double due to the small amount of room our older child would have since there’s practically no room between one seat and the other. The Donkey is, in my opinion, too wide and heavy to be functional and walk side by side with my husband on a sidewalk or busy city street. My advice is to put your boy in the City Select in the front position facing the way you’d like him to be, then add your basinet or second seat – empty for now, and then take it out for a spin (up and down a set of two or three stairs for example) and see how it feels to really movie it about. If I had done this I wouldn’t have purchased it. And my little girl is small for her age! Good luck! I’m curious to see what you choose. I just love the level of comfort that their double stroller offers the children, and I have a lot of confidence in Teutonia’s high quality and robustness. This stroller price is quite good.